A brain imaging technique that uses no radiation and no contrast agent appears to detect the earliest signs of impending cognitive decline in the elderly, a new study says. Paired with an assessment that looks for other warning signs, researchers said the imaging test may offer an easy, low-cost way to single out seniors at high risk of developing Alzheimer’s disease for intervention before mental decline is evident. In a study of 148 seniors with no neuropsychiatric diagnosis and 65 with a diagnosis of mild cognitive impairment, the imaging technique — called arterial spin labeling — detected a telltale spot of low blood flow in the brain’s posterior cingulate cortex that predicted mental decline 18 months later. Incidental to their findings, the researchers also discovered two neuropsychological tests that appeared useful in predicting impending mental decline. Neither test assesses memory explicitly and one of the two is not widely used in batteries testing patients for mild cognitive impairment. The latest research, conducted in Switzerland and the Netherlands, was published Tuesday in the journal Radiology. The researchers then compared both groups’ brain scans using arterial spin labeling with those the 65 patients with mild cognitive decline. Even 18 months before their mental faculties were judged to be “deteriorating,” the scans of those subjects showed low blood flow in the posterior cingulate cortex, a structure that sits atop the mid-brain and becomes highly active when our attention is wandering freely and we ponder our inner worlds. The telltale pattern of low blood flow to the posterior cingulate cortex was also highly evident in the scans of subjects with mild cognitive impairment. 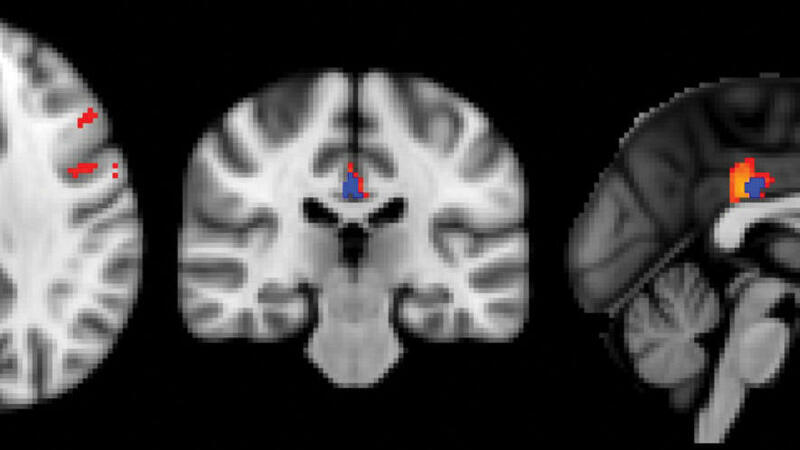 On average, those whose cognitive status showed no downward shift showed normal blood flow to this key brain region. In those with impairments, the researchers noted a less dramatic trend of low blood flow to the bilateral superior and middle frontal gyrus of the brain, part of the brain’s frontal lobe that governs higher-order thinking. Many imaging studies have found that in patients with full-blown Alzheimer’s disease, the posterior cingulate cortex shows dramatically reduced activity and reduced blood flow. But the finding that these trends are evident well before Alzheimer’s sets in is new. The authors of the latest study conclude that the technique demonstrated here may help identify those at highest risk of Alzheimer’s for early intervention. But for the close to 4 million Americans projected to suffer from Alzheimer’s disease by 2030, no intervention, early or otherwise, has yet been found to slow or reverse the inexorable loss of memory and function that comes with the condition. Still, the technique described here may prove useful in helping detect which promising measures or therapies are working. 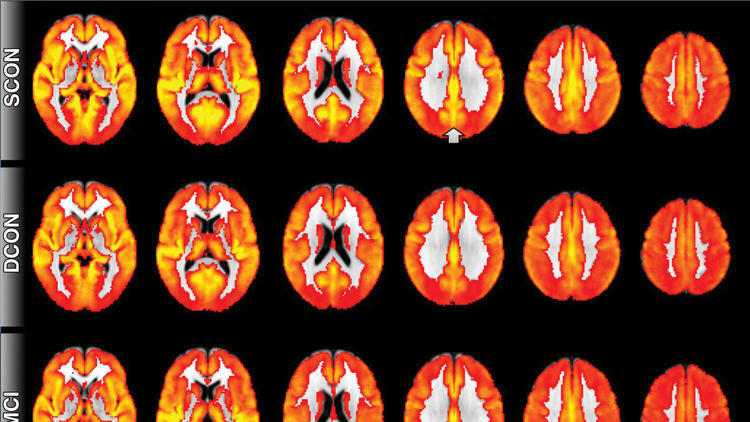 Unlike many scanning techniques (including positron emission tomography) designed to measure “perfusion,” or blood flow, arterial spin labeling introduces no contrast dye into the brain. To clock the speed or measure the volume of blood passing through a region, scientists magnetically “tag” certain water protons in circulating blood, making them visible by magnetic resonance imaging. The technique’s low cost and risk make it an attractive option for neuroscience researchers, who’ve been using it for about 15 years to peer into the brains of healthy subjects, as well as for patients who will need repeated scans or who have kidney problems that make the use of contrast dangerous. I write frequently about memory and cognitive function. Follow me @LATMelissaHealy and “like” Los Angeles Times Science & Health on Facebook.